Buy construction fittings are no problem. There are fasteners on all cases. Clamps for mounting pipes, clamps for the repair of various size and destination. But sometimes there might not be a store fixture and you want to make a coupling clamp. 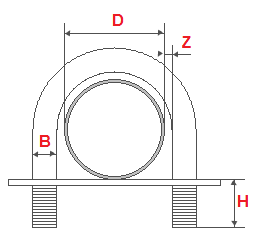 The clamp consists of threaded studs with nuts and pressure plate. Hairpin bends on the diameter of the tube and the metal clamp is ready. The pressure plate are drilled two holes. She is put on a hairpin and nestles on the tube as a clamp. Often used in the construction of fences, which are attached to the plate.